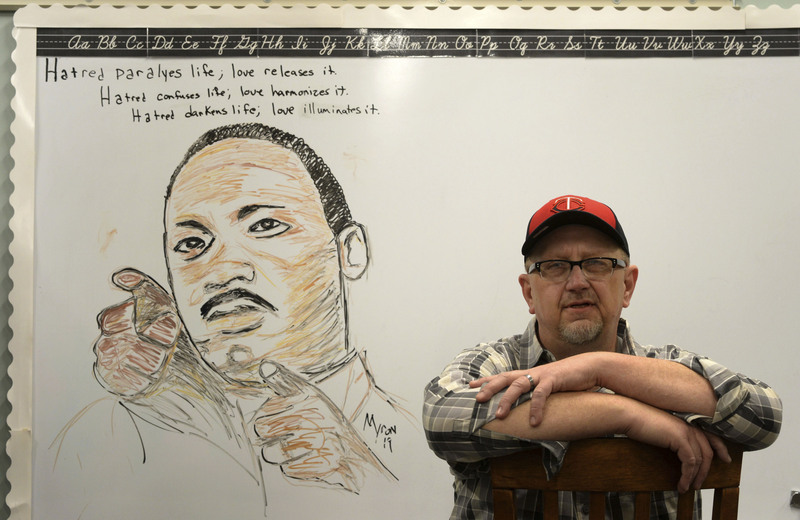 ST. PAUL, Minn. (AP) — Myron Peterson lifted his Minnesota Twins baseball cap with one hand and wiped the sweat off his face with his big red hankie, squinting his eyes at the bright fluorescents lighting the classroom at Christian Heritage Academy in Lakeville. “This is my new normal,” he said to Twin Cities Pioneer Press. He lost his ability to bike and fish, two of his favorite pastimes; he lost his job as a facilities manager of two megachurch campuses; and, for a while, he lost his will to live. “The old Myron is gone,” he said. But at the same time the accident took all those things from him, it gave him an unexpected gift — artistic talent. Peterson, 52, who lives in Shakopee, said that before the accident, he could only draw stick figures and copy simple cartoon characters like Snoopy and Garfield. Now he draws realistic works of art, like a bust of the Rev. Martin Luther King Jr. or a group of boys playing hockey. He can’t explain it. He thinks he may have had the ability inside of him but just never took the time to practice. There was a time when nothing could slow Peterson down. Before the accident, he’d worked for Mystic Lake Casino in Prior Lake for 27 years as a property manager. He did snow removal, coordinated outdoor events and had between 25 and 100 people working under him, he said. For about four years, he worked for a megachurch in Lakeville that has a campus in Shakopee. He biked to work, averaging more than 100 miles a week. He was the go-to guy for neighbors who needed things fixed. And he did a lot of volunteering. He married Kay, a second marriage for both of them, and has two grown sons. He and Kay always spent date night at church. Two days before Thanksgiving, on Nov. 22, 2016, Peterson was driving north on Interstate 35 near the Buck Hill ski slopes in Burnsville. A sloppy snow was coming down, making the roads slippery and the traffic slow. Another driver lost control, hitting the cement barrier and then Peterson’s Toyota Camry. He was able to move his car out of the way and drive home. At first, he and Kay thought they’d dodged a bullet. Peterson seemed fine. He’d hit the left side of his head pretty hard on the car door, but he wasn’t broken or in the hospital. His neck and head hurt, so they went to the emergency room and got the all-clear. He was told he’d be sore for a while. Peterson had a traumatic brain injury that affected his vision and his balance and made it difficult for his brain to process stimuli. He described it as having all the volumes of all the noises around him on high. To help his brain heal, he had to spend up to 18 hours a day in a dark room with no electronics, no noise and no light. “With a TBI, you only have to change one thing in your life and that’s everything,” Peterson said. Then came the multiple doctor appointments. He had vision therapy for his eyes and was fitted with prism glasses to help with the double vision. He saw a neurologist every two weeks and went to the Courage Kenny rehab center at Abbott Northwestern Hospital in Minneapolis. But Peterson wasn’t fine and knowing that got him down. Part of the problem was no one would hire him. A mutual friend connected him with Gail Wolfe, the principal of Christian Heritage Academy in Lakeville. Wolfe met with him and thought he’d make a great fit as a janitor. He could work when the school was empty and quiet and his time could be flexible, allowing him to rest if necessary. Little did Wolfe know she would be getting more than just a janitor. As Peterson worked his way through the classrooms, emptying garbage cans and mopping floors, he would pause in front of the whiteboards and think of them as empty canvases. Eventually, he started picking up the markers and drawing pictures, trying to pair them with what the students were studying or things he knew the teacher liked. But these weren’t just stick figures. These were drawings with shading and dimension, something he’d never done before. The students loved the mystery, wondering who was drawing and what picture would be there the next day. Eventually, folks figured out it was Peterson, and when KARE-TV did a story on him that went nationwide, he found he had fans beyond Minnesota. Some even sent him art supplies. Peterson said drawing helps take his mind off of his headaches. He also has his “care team” at home: Jackson the Goldendoodle and Jasper the toy poodle. “When the pain level gets to a seven, they follow me around and won’t let me out of their sight,” he said. Was Peterson given a mysterious new gift or was it a latent talent that had never been honed? Stoner explained that Peterson was hit in one of the primary vision centers of the brain that also affects balance. She said the trauma caused a release of chemicals that leads to a decrease in blood flow, resulting in an energy crisis. The number of hours Peterson is awake and functioning has to be matched with the same number of hours resting and recuperating, he said. Stoner has never had a patient develop new talents after a brain injury that she can remember. But she has seen patients with injuries like Peterson fully recover. Peterson said he wants people to know two things. Will he ever get his old life back? Peterson said he doubts it. Doctors gave him two to five years to heal, but after the first year, the healing slows down. Kay said what she misses most is their church dates, something Peterson can’t handle because of the loud music and lights. But she still finds reasons to hope. Peterson said he’s grateful to be alive.